Happy Friday Wyrdos! This Sunday many young children will be hunting for eggs, but in the Other Side the egg will be hunting for you! 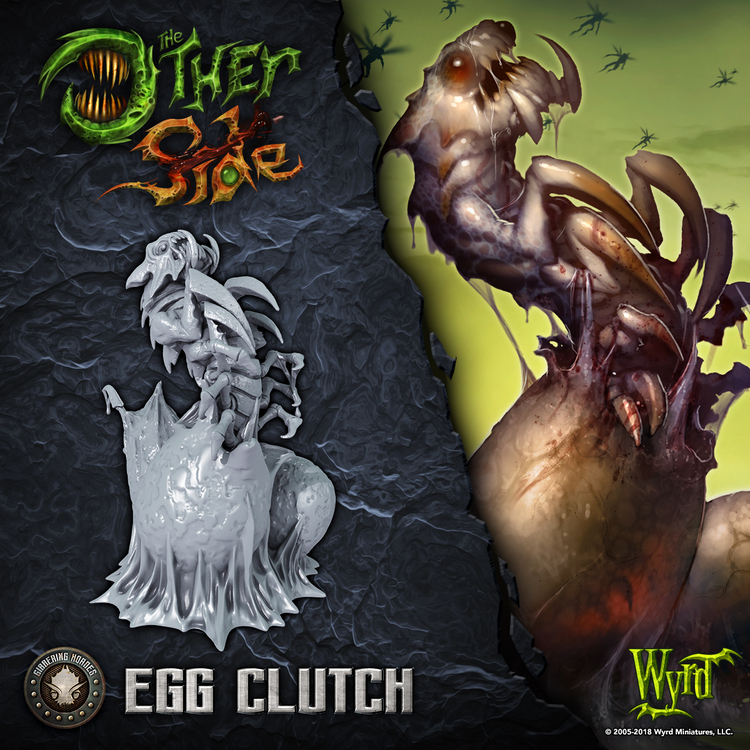 That is because we are previewing the Egg Clutch of the Gibbering Hordes! What can be said about a pile of eggs? The Gibbering Hordes reproduce almost exclusively through the laying of eggs, and since their appearance on Earth, more and more of these Egg Clutches are being discovered in the dark and damp places of the world. Which species an egg will hatch into is a mystery that humans have yet to unravel, though the odds tend to favor Karkinoi or Crawlers, as the former lay a high number of eggs and the later are simply very numerous. The fact that many eggs end up as food for other species is one of the few things that have kept the numbers of the Hordes at least somewhat in check back on Malifaux. On the table, Egg Clutches don’t do much. Despite this, they are still quite useful. They are able to come back into play when killed via Endless Numbers, and they make an excellent target for Survival of the Fittest. When they are no longer needed for support, they can hatch and become another hungry creature in the Hordes’ forces. What an Egg-citing Easter Egg-travaganza! This model is no yolk, so you better be walking on eggshells around them! Ok, I'm done... I think this week has just made me... crack. Egg jokes are certainly fertile territory. These are sure to shell out fast! Gibbering Hordes players of all varieties should scramble for these eggs, poach-haste. What is it about TOS previews and bad puns? BTW you guys stole all the good puns so I am yoking out of this one. You've got egg on your face now. I thought she was clutching at straws, but instead it seems she is hatching something. If this keeps up all shell will break loose, but I have a feeling it won't be overeasy. I'll be playing (probably) Burning Man as my main, but damn, Gibbering Hordes will be the most fun to paint.